Buy K. A. Cook a Coffee. ko-fi.com/kacook - Ko-fi ❤️ Where creators get paid by fans, with a 'Buy Me a Coffee' button. 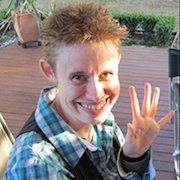 K. A. is a pan-ace aro, genderless, autistic, mentally ill, disabled and queer writer and blogger. They write creative non-fiction, personal essays, short stories and serial novels about the above on the philosophy that if the universe is going to make life interesting, they might as well make interesting art. Thank you so much for supporting an indie ownvoices blogger and writer! Your donations help me continue to write stories about trans and autistic heroic protagonists and engage in stimming and aro-spec community support by my @aroworlds and @stimtoybox blogs on Tumblr. I could not work without your generosity! Secured Payments. Support goes to K. A. Cook's account. Upgrade K. A. Cook to a yearly Gold Membership with a one-time payment.